Cook vermicelli as directed on package. Drain; cover to keep warm. Meanwhile, in small bowl, mix orange juice, cornstarch, soy sauce, sugar, five-spice powder and pepper flakes until well blended; set aside. Heat 10-inch nonstick skillet or wok over medium-high heat. Add beef, onion and garlic; cook and stir 3 to 5 minutes or until beef is desired doneness and onion is crisp-tender. 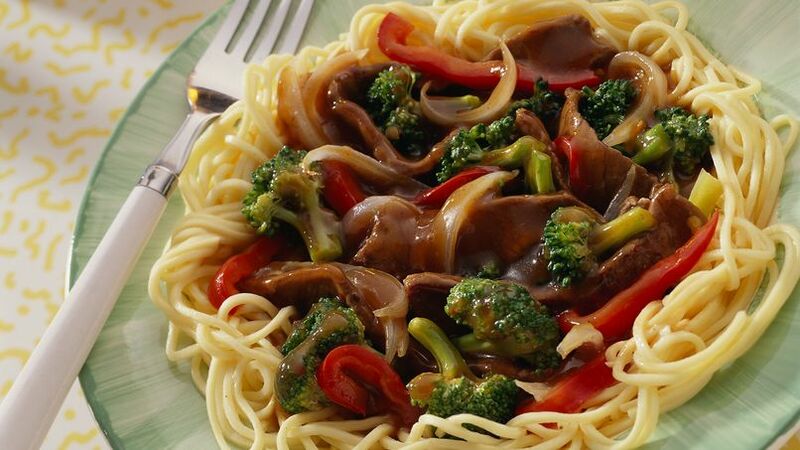 Add broccoli and bell pepper; cover and cook 2 to 4 minutes, stirring occasionally, until vegetables are crisp-tender. Add cornstarch mixture; cook and stir 2 to 3 minutes or until bubbly and thickened. Serve over vermicelli. Bring Asian zing to the dinner table with this broccoli and beef stir-fry - ready in just 25 minutes!